I’m going to tell you about my Teenguin pattern from Penguin: a Knit Collection today, because it has a party feel to it and today is the day I launch the book with a celebration at Wild & Woolly in Clapton. I’m hoping to see some of you there. This pattern was the one that had bobbed around in my head for the longest, even before the teenage penguin link became apparent. I love the first version, Indigo Loops, that I made for myself without a pattern and still wear a lot. There were various issues I wanted to address, when it came to making a pattern. Mainly the squareness of the yoke, where the loop section is a bit too long and the fact I knitted the white bottom-half in Wensleydale Longwool, which sadly means I can’t wear it while cooking, cause it sheds like a fancy Persian cat. I do think the semi-solid indigo hand-dyed merino I bought in Brooklyn years ago worked perfectly for the top half. It was my way of combining a real fancy treat yarn that was a holiday souvenir with something more local and affordable. I really like working elements like that into my patterns. By having two distinctly different zones, you can use two different yarns without where they meet being an issue. This is great either as a way of stash busting or to spread costs – splurge on the shoulder zone and save on the body. I also felt like I could up the lace game from simple butterfly eyelets to something more grown up. The loops however were there to stay. They’re so fun to do! I’m a really taken with loop stitch and like the challenge of working it into garments without having you look like a 1950s poodle gin bottle cosy or a 1970s muppet. I love gin poddles, but for gin! 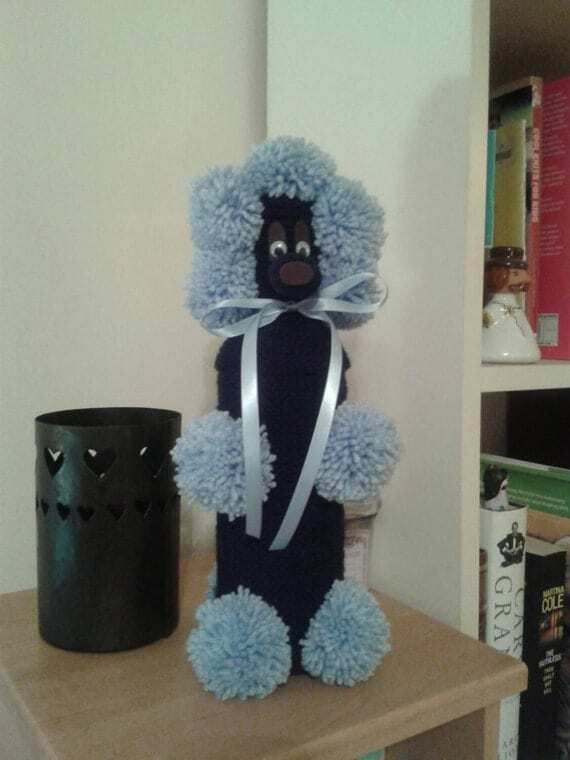 This one is made by Tanis Smith, who goes by the moniker of GinPoodle and you can meet its other gin poodle friends on instagram and etsy. 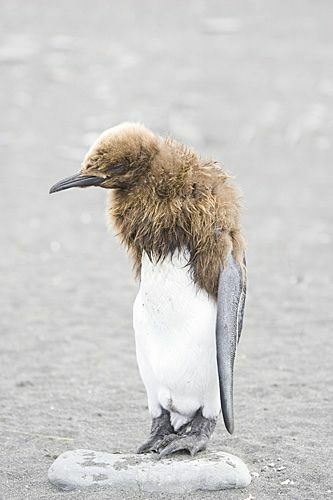 I’ve been having a hard time remembering exactly when the plan to make a collection of penguin patterns solidified, but I think it was when I discovered images of moulting teenage penguins and realised that was the answer to this cardigan. It made the colours fall into place and I could choose a perfect lace stitch that would mimic the the structure of penguin feathers. Pictures of teenage penguins as they moult from chicks into adulthood ending up being an elegant knitted garment so appeals to me. It feels like the Ugly Duckling story additionally proving that even penguins have an awkward teenage phase. I think the result is totally contemporary, yet vintage feeling. Susan Crawford has, on occasion, referred to this as “my cardigan” when offering encouragement and checking in on the progress of Penguin: a Knit Collection. I’m so excited she has been one of the first people to pre-order the book and I know this is the pattern she is looking forward to knitting. Teenguin is worked in two colours of heavy DK weight yarn, the gorgeous Snældan 3-Ply, which you can get from The Island Wool Company. I think it’s the perfect occasion to use two of the beautiful colours it comes in, perhaps even 2 of the 5 greys in the undyed part of the range, but you could stick with just one. 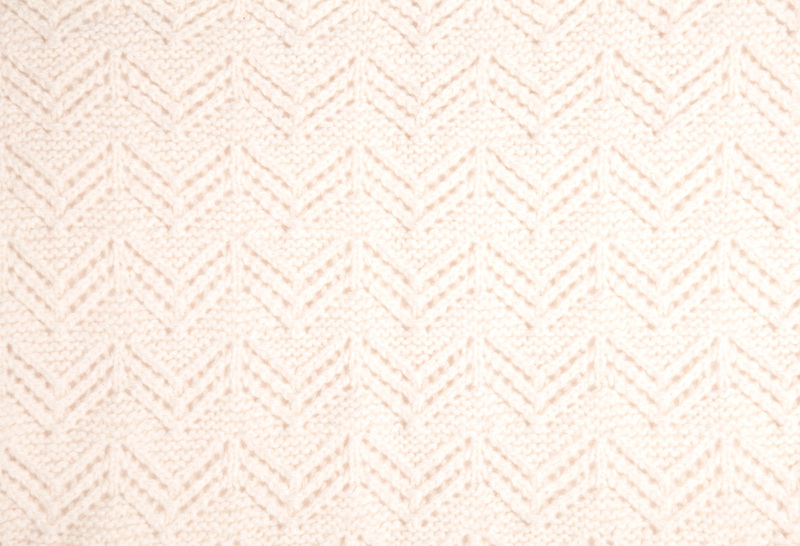 The body and sleeves of this cardigan are worked flat in a lacy chevron stitch incorporating an unusual amount of garter stitch. This means the delicate lines of lace don’t need to be disrupted by ribbed cuffs, as the stitch sits flat of its own accord. I felt like Kay wrote her recent post to Ann on Mason Dixon Knitting (about working the sleeves of her Monomania cardigan flat rather than in the round as specified) was written for me. Or maybe the flat knitted sleeves of the Teenguin were made for her? I know there has been a mass embrace of the circular needle, but I would encourage people to get out their old straights on occasion, whenever you can really, as I think it’s good to mix things up for your posture and wrists. Teenguin is designed to be worn with zero or slight negative ease (allowing the stretch of the fabric to give the space needed for movement). Belinda Boaden and I had many a good chat about the dispensability of shaping in knitwear. We agreed that for the most part, the stretch of the fabric can provide the shaping you need, or rather, your body provides the shape and the knit will fit to it. If you prefer more ease, go up a size. I’m thrilled with how this one looks on all sorts of body types. If you really crave bust or waist darts, add them in where your actual bust and waist is, rather than where I, as the designer, think they might be based on my own body and standardised measurements. I miss Belinda so much: she was always filled with constructive critical opinions, humour and care. The book is dedicated to her, in loving memory. 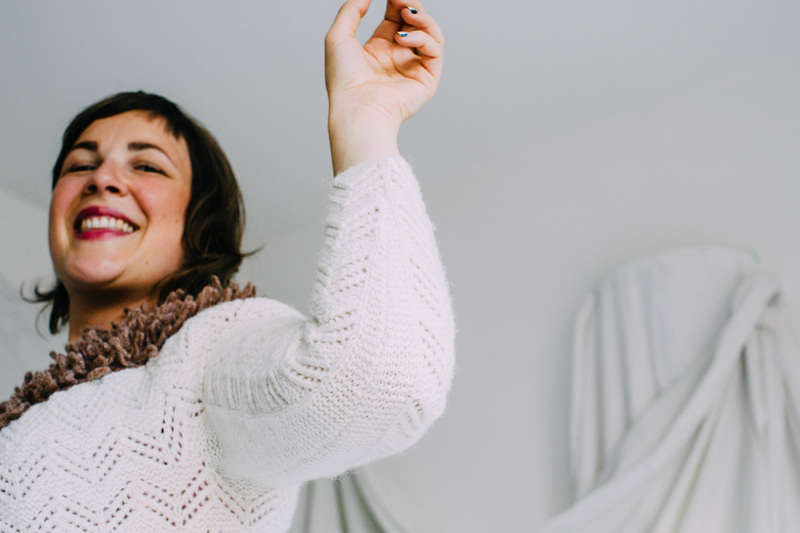 You can find the pattern details for Teenguin on Ravelry and soon purchase it from your LYS (you might need to ask them to order it in, if they haven’t already arranged to stock it).